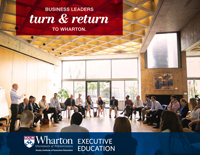 Wharton helps executives advance their careers at every level. Our world-renowned faculty combines cutting-edge knowledge with innovative program design to transform individuals and organizations. Each year, more than 13,000 executives from around the world choose Wharton. Join us. A complete listing of all upcoming programs for individuals. Experience Wharton thought leadership in action. More than 50 programs combine research, analytical rigor, and experiential learning for truly remarkable results. Dean Geoffrey Garrett shares the value proposition of Wharton and the power of leadership development. Prof. Peter Cappelli explains how Wharton works with companies to design programs that develop leaders at every level. 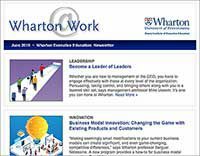 Designed exclusively for executives, Wharton Online’s new Leadership and Management Certificate will help leaders across the organization reach new levels of success.